David Haye is one of the best boxers Britain has produced. 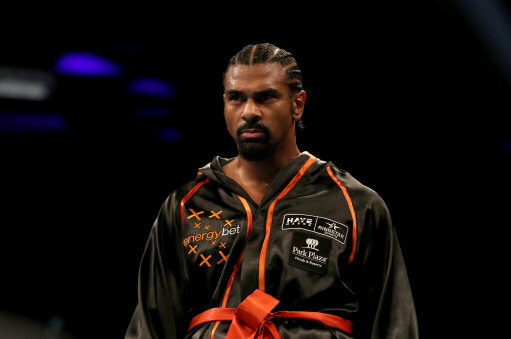 He has won both the cruiserweight and heavyweight WBA championships and is fighting Tony Bellew in 2018.
Who is David Haye, how old is he, when is his birthday, how tall is he, where is he from and what is his background? David Haye was born on October 13 1980 and is 37 years old and 1.91 metres tall. He was born in Bermondsey in London to a white English mother and a Jamaican father. He started training in the boxing gym at the age of 10 and first competed in the World Amateur Boxing Championships in 1999 at the age of 18. He turned professional in 2002. Why is David Haye famous and what is his occupation? David ‘The Hayemaker’ Haye is a British boxer who has won world championship titles in both the cruiserweight and heavyweight divisions. What is David Haye’s net worth? The Sun newspaper reports that David Haye is worth around £16million. How much does David Haye earn? In his most recent bout with Tony Bellew in March 2017 the two boxers shared a purse of over £7million according to The Sun newspaper, with Haye taking home £4.2million. According to the BBC, Haye earned £10million from a single fight in 2011 when he lost to Wladimir Klitschko. How much does David Haye weigh? For his fight with Bellew in March 2017 Haye weighed in at 233 pounds or 106kg according to SkySports. When was the David Haye vs Tony Bellew fight, what was the result, how much was the prize money? David Haye and Tony Bellew fought on Saturday 4 March 2017. The fight went to 11 rounds but Haye injured his Achilles tendon in the sixth round and Bellew dominated from this point. Haye was knocked down in the 11th round and although he was able to get up but retired from the fight, giving Bellow a TKO (technical knockout). The purse for this fight was over £7million. What football team does David Haye support? He is an enthusiastic supporter of London football club Millwall FC. In early 2014 Haye became a vegan after watching a television documentary about factory farming. He has since launched range of vegan protein powder products. David Haye has not retired. He is scheduled to have a rematch with Tony Bellew on Saturday 5 May 2018 at the O2 arena. Does David Haye have any children? David has a son, Cassius, with his ex-wife Natasha. Cassius is named after Cassius Clay, Muhammad Ali’s real name. Who has David Haye fought in boxing matches, how many fights has he won, what are his most famous fights? Haye has had 31 professional boxing matches, winning 28 and losing three. In 2008 Haye beat Maccarinelli to win the world cruiserweight title and this was billed as the biggest all-British boxing match since Eubank v Benn. Soon after, Haye moved up to the heavyweight division and won the WBA title by beating Valuev in 2009. In 2011 he fought Wladimir Klitschko. This fight was broadcast in over 150 countries to an audience of 500 million viewers. Haye was defeated in an unanimous decision. It has been reported that Haye had a broken toe at the time and this restricted his ability to push off his back foot. 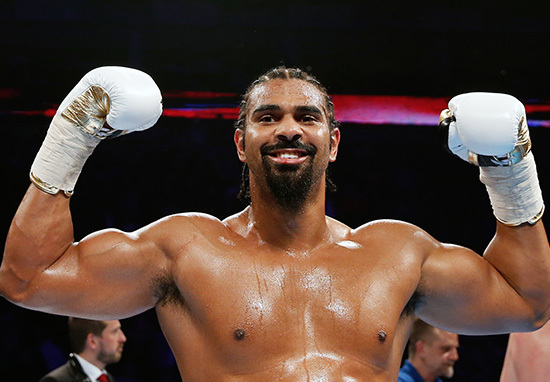 More recently Haye has rebuilt his career, first with his KO of Australian de Mori in 2015 and then with his second-round win over Swiss national Arnold Gjergjaj in 2016. Haye then fought Bellew in 2017 but was forced to retire in the 11th round after suffering from damage received by his Achilles tendon in the sixth round. A rematch took place in May 2018 with Haye suffering defeat to Bellew by a fifth round stoppage. Is David Haye married, who has he dated in the past, was he married? David Haye married Natasha in 2008. They have a son, Cassius. In 2011 Haye was linked to X Factor hopeful Amie Buck. The Hayes divorced in 2016 after rumours of David’s adultery resurfaced.